I’ve visited Taranaki a few times in the past few years, and I used to think that clouds stuck to Mt Taranaki in the middle. Now I know that it’s really the entire Taranaki district that’s clouded over, but the mountain’s as clear as a bell. Of course, you have to be up the mountain to see this. Looking down on Fanthams Peak and Syme Hut. Having dragged myself out of bed in New Plymouth at 5.40am, I spotted at least 10 rabbits along North Egmont Road leading up to the visitor’s centre. I guess it’s difficult to control rabbits, and they repopulate so quickly. Location: Egmont National Park, from North Egmont Visitor’s Centre. Huts visited: Tahurangi Lodge (0 nights). Route: Follow the road from the visitor’s centre up The Puffer past Tahurangi Lodge, then up Lizard North Ridge to the summit. The name of the mountain has an interesting recent history. It was been called “Taranaki” by local Maori long before James Cook first visited and named the mountain “Egmont”, after a British politician who’d promoted Cook’s first voyage to New Zealand, but who never set foot in the country. In 1865, during the Taranaki Land Wars, the New Zealand Government confiscated the mountain and other land from local Maori and distributed it between settlers for farming. The exception to this distribution was the radius around the mountain itself, which became a National Park in 1885. The name “Egmont” might have stuck for this reason, even though the mountain itself was symbolically gifted back to local Maori in 1978. Details of exactly what occurred and how it occurred are still controversial in some quarters. 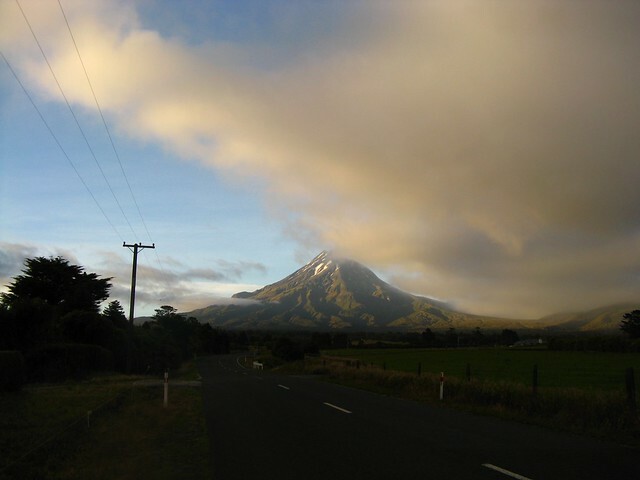 In 1986, the official name of the mountain became “Mount Taranaki or Mount Egmont”—including the word “or”—thanks to an alleged naming mistake that was signed at the time by the Minister of Lands. Supposedly it was meant to be officially named “Mount Taranaki” or “Mount Egmont”, allowing for dual naming and recognition of the historic Maori name. I’ve heard informally that the name of “Mount Egmont” is due to be officially removed 50 years after 1986, but can’t find an online reference for this and I’m not convinced it’s correct. The only prominent modern publication that seems to use the exact modern naming (complete with the word “or”) is Land Information New Zealand’s Topo50 Map BJ29, happily titled “Mount Taranaki or Mount Egmont”. 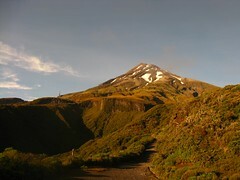 These days official circles and media typically refer to it as Mount Taranaki, while some others (often locals who’ve grown up with the name) still refer to it as Mount Egmont. Personally I prefer to call the mountain Eggie. Driving towards North Egmont Visitors’ Centre, about 6.40am. The mountain itself is a volcano. Volcanic activity originated off the west coast, as an anomaly that’s gradually shifting inwards’s to the North Island’s Central Plateau, dominated by other volcanoes such as Ruapehu, Ngauruhoe and Tongariro. Thanks to this movement, heavily eroded volcanic remnants can be seen off the Taranaki coast, one of the most well known being the 156 metre high Paritutu Rock off New Plymouth. Closer than this is the entire Pouakai Range, which stretches between the mountain and the coast. 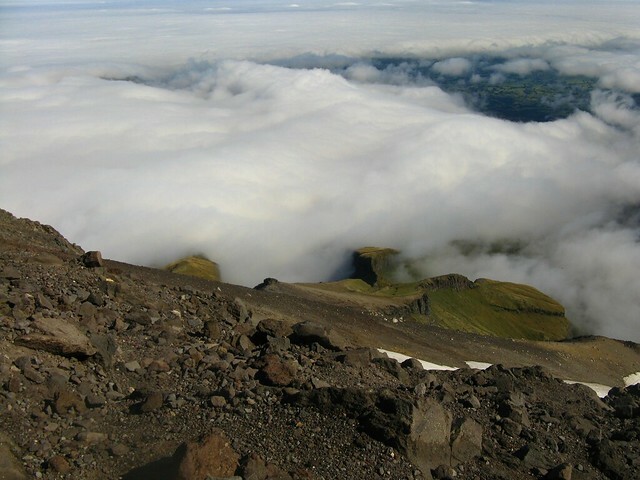 The 2518 metre high Eggie built up over a period of many eruptions, including five cone collapses which is unusual for volcanoes—most don’t experience more than one. 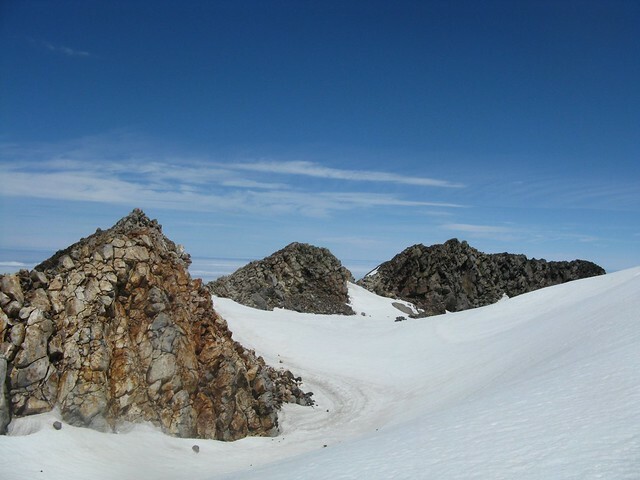 The highest point of the mountain is already ageing and subject to eroding, however, which is an ongoing process exemplified by a big collapse around Pyramid Stream last November. 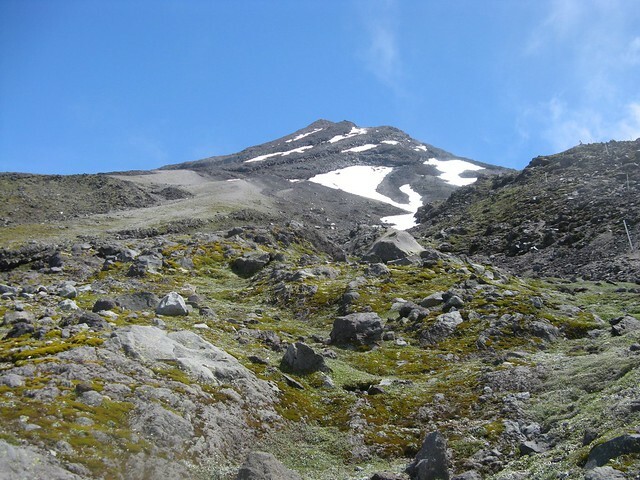 Although eruptions are chaotic by nature, the overall movement of geologic activity is shown by the 1966 metre high Fanthams Peak on the southern side of the mountain, which is geologically the youngest. The mountain’s aiming approximately in the direction of Stratford, which incidentally has a nice ice-cream shop. Eggie hasn’t been active since the 1860s, but geologically it’s very young, about 135,000 years. It’s definitely not extinct, and could decide to erupt at any time, which would be a potential disaster for the region given how much the economy relies on surrounding farms that take advantage of the volcanic soil. 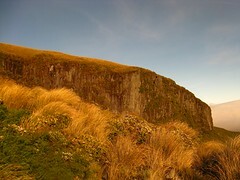 For recreation, Eggie happens to be one of the deadliest mountains in New Zealand. To date, an official count of 63 people have died either high up the mountain or in the surrounding national park. It’s not especially large as New Zealand parks go. 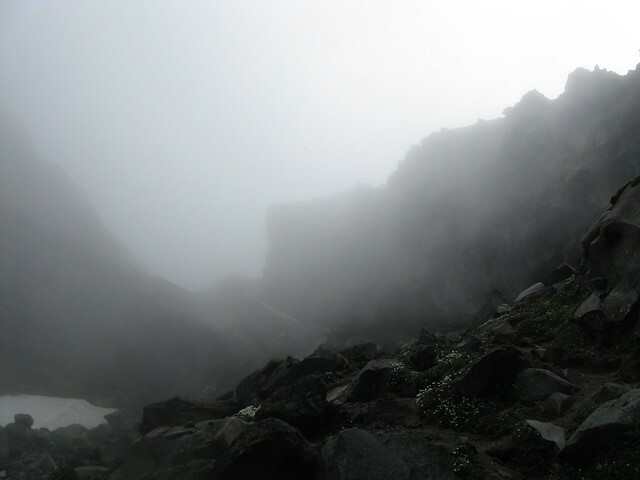 The number of deaths is probably a consequence of its proximity to the coast, its isolation from other recreational areas which makes it the most obvious thing to climb, the relative ease of getting to the top, and the tendency of many people, including experienced mountaineers from both New Zealand and overseas, to underestimate the dangers or see it as a training climb. Weather all over New Zealand can change quickly, but around Eggie it can change extremely quickly and catch people in very exposed and dangerous places from which it’s difficult to escape. The weather can come straight off the sea, so in a matter of minutes conditions could change from being quite nice to having almost zero visibility, white-out conditions and freezing gale-force winds. The mountain ices up and catches people off-guard, and long steep sides combined with countless bluffs, created as a consequence of historic lava flows, create a lethal situation for anyone who slips in the wrong place. Further down the mountain, countless rivers that radiate out from the centre can fill quickly when it rains, and catch people unaware between them (as happened in 2008). It was with all this knowledge that I scribbled in the intentions book in the 24 hour shelter outside the North Egmont Visitor’s Centre, and started walking up the mountain from about 7am. To cope with some really nice weather and an obviously clear sky and a good forecast, my daypack included several days worth of snack food, full storm gear including a raincoat, overtrousers and a balaclava, a full covering of polypropylene, gloves, a bivy bag, a first aid kit, 2.5 litres of water as there’s not much available without going sideways, and the usual navigation stuff such as a map, compass and GPS in case of emergency. It was full for a daypack, but I think it makes sense to anticipate things going wrong in New Zealand’s back-country, with Eggie being no exception. Still, nothing especially bad was due to come in until tomorrow afternoon, and the worst element of today’s forecast suggested 40km/h winds from the west. I didn’t feel any great need to walk through bush today and wasn’t too versed on all the possible routes, so went straight for the 4 wheel drive road that leads from the visitor centre straight up a route called The Puffer, meeting a couple of early morning crazy mountain runners already on the way down, and ending at Tahurangi Lodge — a private lodge operated by the Taranaki Alpine Club. It’s a nice road, and one that’s only there because it was built to service the TV transmitter, which would almost certainly never be granted within a National Park in today’s environment. It took about 40 minutes to reach the track junction 800 metres south-west from Maketawa Hut. The sign-post pointing back down to North Egmont at this point indicated 90 minutes, so I guess I was going at about twice that rate, but 90 minutes sounds like a conservative estimate. It took a further 30 minutes to reach Tahurangi Lodge, where I stopped for a look around. The lodge sits a minute or two up the slope from the giant television antenna. It’s about here where some of the bluffs that surround Eggie become more apparent. 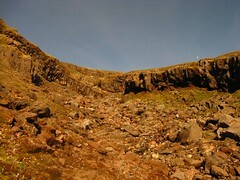 High cliffs at the end of the rib over to the right are a result of lava flows that were moulded by ash, before the ash eventually eroded away leaving steep bluff-faces. It’s a landscape that’s not well matched by many other nearby places, including the other nearby active volcanoes across the way in Tongariro National Park. 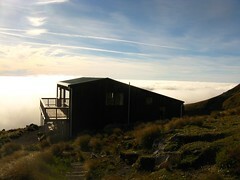 The sky was still absolutely clear above, but by now cloud had rolled in with a top not far below the lodge. I guess I must have been racing the cloud and reached a high enough point before it rolled in below. This was great in that it made it easy to see that nothing especially ominous was coming in from the west, but it also meant there wasn’t much landscape to see below. No matter. interspersed with scree and wooden steps. The slope is stepped above Tahurangi Lodge, but not as much as I’d expected. When told by someone to expect wooden steps, I thought it might be millions of artificial steps as occurs on the southern side, leading towards Syme Hut. 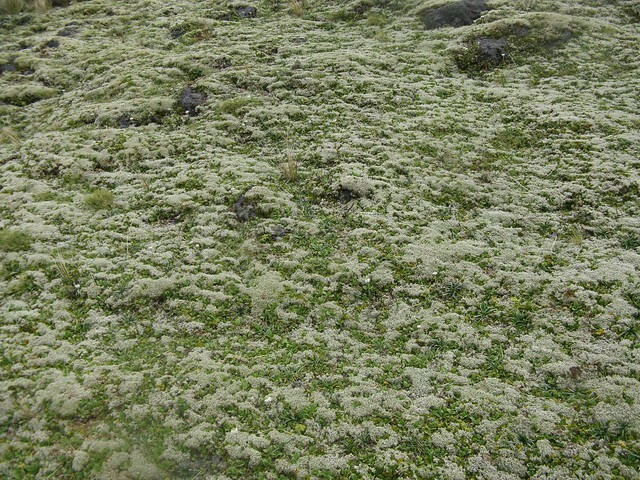 There are actually only a few hundred at most, and then the climb eases into a rocky and scree slope. 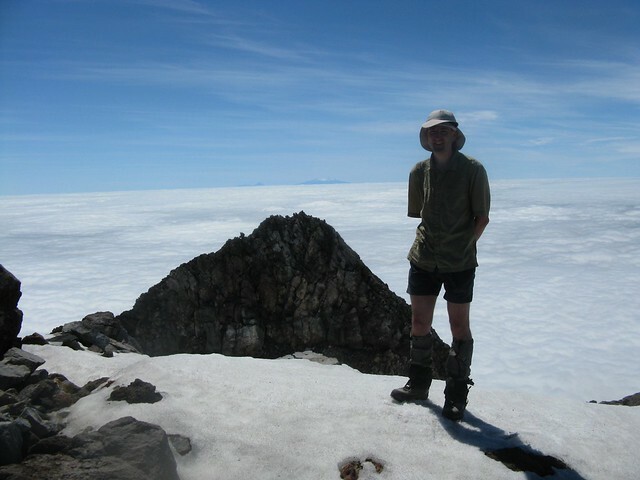 From Tahurangi Lodge to the summit is a climb of about 1500 metres to 2518 metres, or about 1000 metres. The horizontal distance walked to gain this elevation (at least according to my GPS) is about 2600 metres, so the average gradient works out to about 1/1.7, or about 36 degrees, which is quite steep for an average gradient. Few people were around at 8.20am on Boxing Day, but I met one woman who seemed mostly interested in photography and turned around soon after Tahurangi Lodge (with the clouds rolling in below). It’s a mostly consistent slope, and it’s helpful to have bendy ankles. 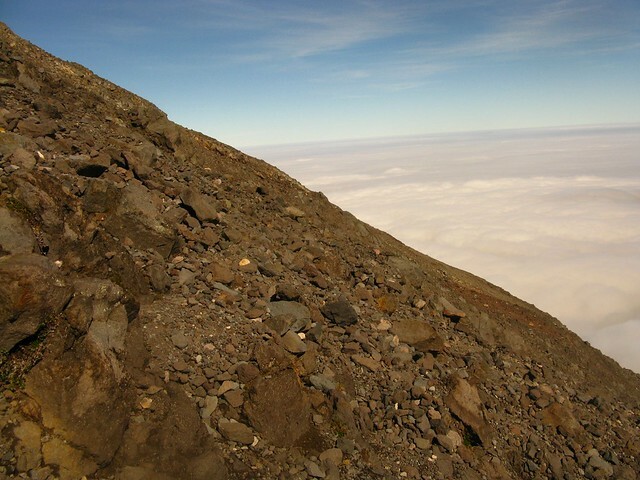 Most of the climb, at least in summer, is a scree slope, and surrounded by a flat plane of mostly-white cloud below, I trudged on upwards along Lizard North Ridge. In time I met two more people coming down who said they’d left at about 1.30am. I forgot to ask where they’d come from, so I’m not really sure if they walked up from North Egmont to see the sunrise, or if they’d come up and over from another side. The route’s poled, and easy to see — certainly in summer. 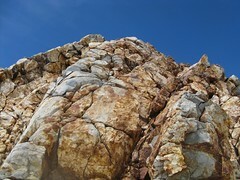 Fortunately it’s also not the two steps forward one step back style of scree which I was concerned about. I’m not a natural over this kind of terrain, and I think what I find trickiest is the perpetual and constant slope, which very rarely provides a flat space to stand. For me it ensures that turning around and looking behind can be a mildly dizzying experience. Being by myself was really what made it matter, though, because I personally tend to rely a lot on being able to distract myself by talking to other people. This was starting to get to me, too, and at about 9.30am and 2280 metres above sea level (about 230 vertical metres from the summit), I sat down for a rest and reasoned with myself that I really didn’t need to go on, more or less deciding that I’d just go down again. I think this is looking roughly in the direction of Holly Flat, which would be towards the left side of the photo. As with everywhere on the mountain, the eroded volcanic landscape below was very impressive, but certainly not a place to go for an uncontrolled winter slide down the ice. I finally got up, started heading up the hill again, then remembered and turned around to go down. And it was right about this moment that I ran into a nice guy named Stuart, who was on his way up. After a quick chat, I ended up turning around again and going to the summit with Stuart. The entire lack-of-distraction problem was solved, and taking my mind off the surroundings was really easy when I had someone to yak away to. Amusingly enough when I mentioned I was up from Wellington, Stuart asked me about this website, which I hadn’t been expecting. I guess New Zealand’s a small country, and the outdoor community’s even smaller. Being a local, he was on about his 80th-odd climb to the summit, and had plenty of stories to go with it, including a near miss of being caught near the summit in a thunderstorm. He’d also spent plenty of time in the Tararuas and Ruahines, which I think might have been where the knowledge of this website came from. Conveniently, snow wasn’t a problem near the summit, which we approached about 10.45am or thereabouts. 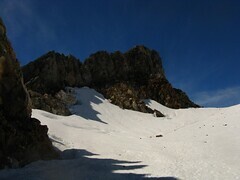 There was a surface of snow around the basin under the summit, but nothing tricky and it was easy enough to kick steps. 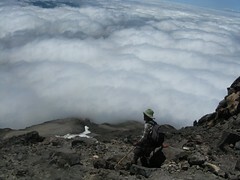 We stood on the summit at 11am, opposite the top of Sharks’ Tooth, which at 2510 metres is 8 metres lower. Stuart pointed to the melted surfaces of some of the rocks, presumably from lightning strikes. I think the only down-side of reaching the summit was the sheer amount of graffiti that people have scraped and scribbled around all the rocks, which was a bit of a let-down. I guess it’s something to be expected in a place that gets so much foot-traffic, and it’s hard to police. In time, of course, Fanthams Peak or another weak spot nearby will simply blow and the entire summit will probably be covered with ash. With no rush to go anywhere, an uncharacteristically low number of people around (I was informed there’d often be 100 or 200 people on the summit open climb), and the weather being comparably terrific with Ruapehu brilliantly clear in the distance, we hung around and greeted the few other people arriving at the summit. I think the only thing that might have made it more interesting would be if the entire district below hadn’t been enveloped in cloud. The clock on the summit eventually reached lunch time. I didn’t realise there would be so many flies on the summit, and I wonder what they eat when people’s food isn’t around. Looking around the south side. 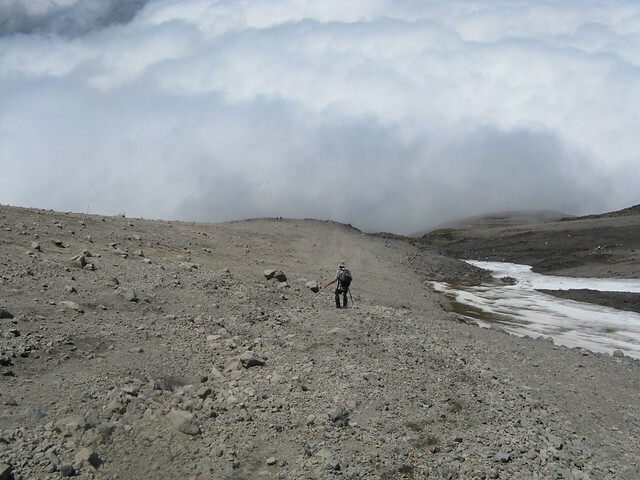 We hopped down after midday, and Stuart showed me around the south side between the snow and interspersed volcanic rock. He pointed out that if caught out camping in bad weather, at the very least there’s always somewhere relatively sheltered near the summit. For a while we looked down onto Fanthams Peak, the ascent from which would have been great with crampons, and watched someone emerge from Syme Hut and wander around a bit. At about 1pm, we began to shuffle downwards in the direction from which we’d come. I’m glad I’d woken early and left the carpark at 7am, because it was on the way down that we began to see the hoardes of people coming up, maybe after having worked off mild post-Christmas hangovers. Stuart recognised a couple of people coming up, including one of the guides on his daily trip to the summit, despite having no clients today, and probably on his way to the top for the several thousandth time (no exaggeration). Despite my tendency to get more nervous when there’s nothing to talk about, I don’t seem to have much of a problem talking about risks and things going wrong, and in the past I’ve managed to make other people nervous by happily chatting about exactly every possibility that could become catastrophic in the immediate environment, which is fine for me as long as my mind’s distracted by the talking. Stuart didn’t mind. We spent some time chatting about various things including aspects of outdoor first aid (and outdoor first aid courses), and various ways people have died on Eggie. 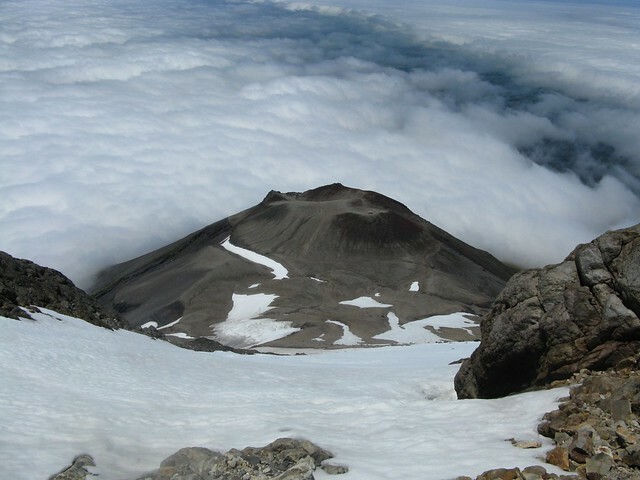 At about 2180 metres we avoided the ascending traffic by shifting through the scree on the southern side of North Ridge, dropping into the cloud at about 3pm, around the top of the wooden-stepped section and reaching Tahurangi Lodge 10 minutes later. From here we followed the road back to the top of North Egmont Road, reaching the carpark and visitors’ centre at around 4.45pm. Almost 10 hours wasn’t a speedy climb and descent of Eggie, there wasn’t much motivation to be quick on such a nice day. The clouds had climbed above Tahurangi Lodge by the time we returned. I think climbing Eggie really gave me a different perspective on Egmont National Park. Until this occasion, my main experience in the park had really been trudging around the circumference or treading on boring boardwalks (albeit necessary given the popularity). It’s nice, but I guess I also didn’t fully rate it compared with areas like the Tararuas and the Ruahines for interesting and variable terrain and remoteness. Just ploughing straight up the side to the top is a very different thing, though, and for me I think this is when Eggie came into its own, and became a place that couldn’t really be matched by some of the less obvious mountainous areas that are within nearby districts. It was a really nice way to end before heading overseas for a while. As I’m writing this, I’m now sitting in a very flat Melbourne, and it’s something I think I can look back on with good memories. This entry was posted in daywalk and tagged bagged:tahurangi lodge, daywalk, egmont, egmont national park, independent trip, screeeeee. Bookmark the permalink. really like your pictures and tramping trip reports. my partner and i are both not kiwi and live in Wellington. your trip reports really help us a lot. we just take tramping seriously a few months ago. Will definitely do some more in the near future. I was on the summit a few years ago when a mob of about 9 goats came into the crater from the south , walked across the snow and out over the north east rim. certainly not what I was expecting. Hi Huey and John. Thanks for the feedback. I can’t say I’d have expected to see goats up there either, but in hindsight if they’re in the park, I suppose there’s not much to stop them from heading up if the conditions permit. A most interesting report backed up with superb photographs. I like the photo looking down on Fanthams Peak. It’s strange seeing it that way – looks like you could slide down and jump off into the clouds! Great article, I’m planning to attempt this climb on Saturday. Interesting about the flies haha, can’t escape them! Excellent article. I am planning to go there in March. I have great memories of climbing Taranaki in April 1988. I did the climb on a clear day with a local guy. An unforgettable – and for me – probably a once in a lifetime experience. I remember seeing light aircraft flying well below us in the distance, and I think we only saw 3 or 4 other climbers the entire day. Thanks, Pavlo. Great to hear you enjoyed it. Hi Anand. Thanks for the comment. I’m very sorry that I can’t recollect the details of the steps beyond what I wrote, which is essentially that there are some further up from Tahurangi Lodge (not necessarily re-commencing immediately above where the lodge is situated, though). I’m not sure if steps (or lack of them) is the most significant factor of the climb, though. It’s steep the entire way up, but doesn’t get technical (in a way requiring ropes etc) if the conditions are good and if there’s now or little snow and ice. Just be wary of how rapidly the weather can change without warning, and also be prepared to suddenly encounter low or no visibility on the return journey. It’s difficult to give tips without knowing more about where you’re coming from, but enjoy. Cheers. Great description. I’d seen a few tube clips, but the discussion around it were useful. 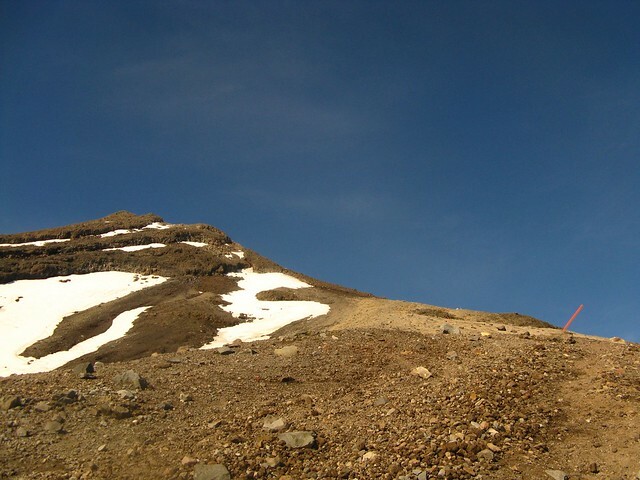 This mountain scares me, due to all the deaths and changing conditions of the mountain that lead to this. Thanks for your account of this – I’m keen to try the summit climb in the next year or two, and found your write-up fascinating and really informative too.